tags: bad food photography, betty crocker recipe card library, blue cheese fruit salad, chilled cornish hens, vintage recipe cards, who puts blue cheese on pineapple? Thaw hens if frozen. Heat oven to 350°. Wash hens and pat dry. Place breast side up on rack in open shallow roasting pan; brush with butter. Do not add water. Do not cover. Roast 1 1/2 hours, brushing often with butter. While hens roast, stir together sugar and cornstarch. Blend in soy sauce and ginger. Cook over medium heat, stirring constantly until mixture thickens and boils. Boil and stir 1 minute. Cool. Brush hens with soy mixture. Roast 20 minutes longer, brushing hens 2 more times with soy mixture. Remove from oven; pour remaining sauce over hens. Cool. Serve chilled. 4 servings. Cut 1 pineapple into chunks; place in shallow glass dish. Sprinkle with 1/3 cup sugar; cover and chill. Remove pits from 1/2 pound dark sweet cherries. Arrange crisp lettuce on large platter. Drain pineapple if necessary; place on lettuce with cherries. 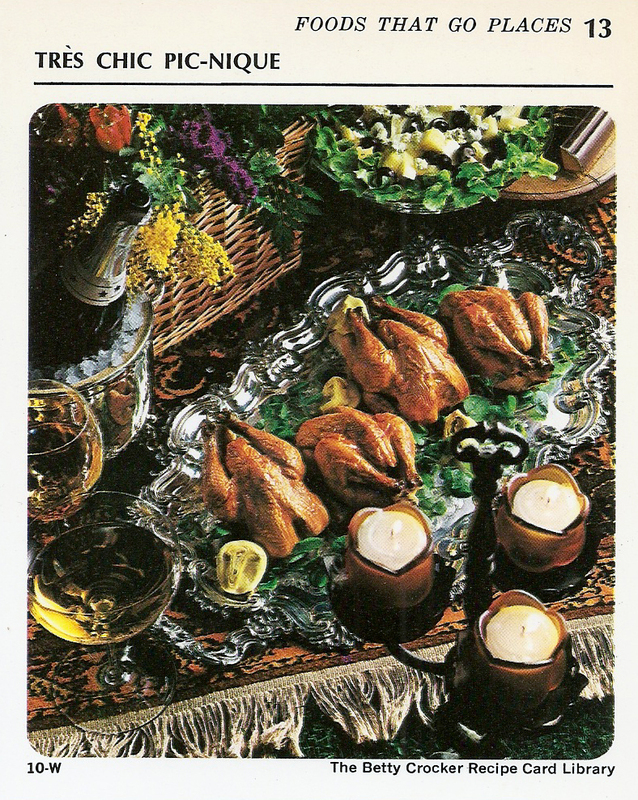 Accompany with bowl of crumbled blue cheese and cruet of salad dressing. Pour dressing over fruit and sprinkle with cheese. 4 to 6 servings.